The Resolution Project: For my New Year’s resolution this year (that being 2011), I decided to try and read all one hundred of the novels picked by Time Magazine as the best since their inception in 1923 to the list’s publication in 2005. I exempted myself from reading ones I’ve already read, leaving some eighty-six or so to read before the end of this year. Some spoilers may lie ahead, so be warned. This book took a while to get going, but once it did, it was pretty gripping. As the story opens, Nat Turner is sitting in a Virginia jail cell waiting for his certain death. His state-appointed attorney, Gray, asks him to dictate all of the actions and events that led to his bloody uprising, which was to be the biggest sustained slave revolt in the history of the United States (this was an actual document by the way, used by author William Styron as the starting point for his narrative). Gray takes that narrative and argues it in court, but we as readers are privy to the version of events as Nat himself would have laid them out. The novel goes over most of the young man’s life, becoming both an indictment of the South’s “peculiar institution” as well as a detailed character study of a man who believed angels told him to murder every white person in Southampton County. In his afterword to the book, Styron notes that while he was initially critically lauded for the book, eventually it became held up as being a racist and misleading work. Which is a little strange to me, but it does seem a little weird for a white author to try and tackle what most people would consider to be a quintessentially black story. I felt he was pretty successful though, given the scarcity of primary sources dealing with Turner. 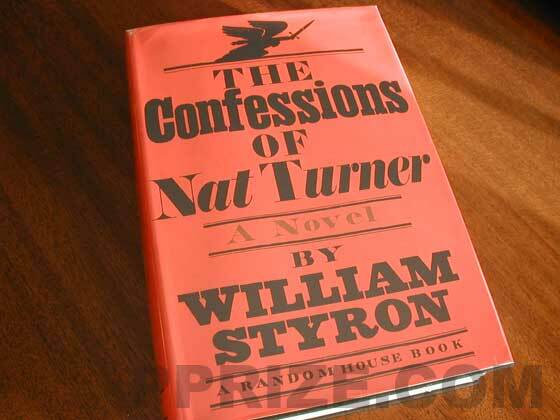 I haven’t read the real confession booklet (which was apparently a huge seller back in the day, as Turner’s rebellion scared the slave-owning states absolutely shitless, and with good reason), but then again, I didn’t really have a bias either way going into it. To be honest, actually, the historical figure that Nat Turner as presented to us in this text actually reminded me most a Canadian man, Métis leader and Father of Confederation Louis Riel. Riel, like Turner, also used his religious conviction and personal magnetism to essentially wage war, his of course being the Red River Rebellion of 1869. I thought Styron did a great job of getting us into the headspace of a religious zealot, which is something I don’t really have too much knowledge about. I really liked the scenes when Turner has visions of how to decimate the white population, an idea imparted to him by armored angels (not to mention days spent fasting in a forest, those helped too). Here’s what Time’s Richard Lacayo has to say about the book: http://www.time.com/time/specials/packages/article/0,28804,1951793_1951939_1952251,00.html. This is a pretty challenging book for a great number of reasons, but it’s definitely worth seeking out if the themes of slavery, religion and violence sound up your alley.